I am not known as a “celebrity photographer” but every once in awhile I get an assignment to shoot someone famous. When I was starting out in my career in the Los Angeles, most of my assignments were with celebrities. I wasn’t thrilled with the work because I really wanted to only shoot fashion. However, being based in LA which is the epicenter of the movie and music industry, most of the work in LA is celebrity based. One of the biggest obstacles in shooting celebrities is the time constraints. Not only does the assignment usually come in last minute, you’re also only given a number of minutes to capture a compelling photograph. Andrew Hetherington, a well-known celebrity photographer, sums it up best: “If they say you’re going to get ten minutes, it’s most likely going to be five minutes. And if they tell you five minutes, it’s most likely going to be two and a half.” This is completely true. Another issue that arises is that because most celebrities have very limited time frames to sit for a photo shoot, often times I will end up shooting in their homes or hotel rooms and it’s a bit awkward as you’re in their personal living space trying to capture a photograph that looks like you spent days in pre-production. – Be prepared! Google and research as much as you can on the person you’re about to photograph. Look at their previous photographs so you don’t emulate anything that’s been shot recently. – If possible, go to the location to get a feel of the environment or ask for any photos of the house/hotel/recording studio, etc so you can start visualizing how you would like to shoot this particular assignment. – Make friends with the PR associated with the celebrity and make communicating with them the most important part of the shoot! – Work with a team who is friendly and fast! You can’t work with divas on these kinds of shoots. The celebrity gets to be the diva, not your make up artist. Sorry! – Keep some cool, portable backdrops you can easily take to a hotel room and put up in 3 minutes to create a nice backdrop in the living room or even bedroom. – Build rapport quickly! You don’t have that 2-hour window while they’re in hair and makeup to sit and chat about life and stuff. I usually go in immediately and introduce myself, shake hands and exchange a few reassuring words on how lovely it is to meet them, how I’m a huge fan or their work and that I will be quick and fast! Confidence is always key but it’s incredibly important to hold that confidence high when you’re working with famous people. – Look for the shot that’s right there! I recently shot Zak Starkey, Ringo Starr’s kid, Keith Moon’s godson and the drummer of the legendary band, The Who. I had 15 minutes to shoot him in his hotel room at The Bowery Hotel in NYC. I walked in and saw he had a terrace off his living room that had black and white striped awning. Even though it was starting to rain, Zak agreed to be shot on the terrace with the NYC in the background. It made for a more interesting shot than his living room, which was nice but not terribly fabulous. Most celebrities are very nice people. The difference in shooting them and models is that models are used to being in front of a “still” camera and posing. Celebrities aren’t models, they don’t necessarily love being photographed. They know it’s part of the job, they need exposure and press and photo shoots are part of this, but they aren’t trained to model for a photographer. The best advice is to just be friendly and remind them that you’ll be fast and the process will be painless. Usually it goes well. Yes, there have been some horrific shoots in the past where the whole shoot was so uncomfortable due to a celebrity not being that nice or a publicist throwing a fit over something like the styling. I won’t name names but I once had a shoot with a very A List actress who’s publicist was so awful I literally could only shoot about 20 frames before the shoot got called off. She didn’t like the clothing that the stylist brought, but this became my fault. But honestly, for me, one of my biggest stress factors on celebrity shoots is truly the time constraints. I was hired to shoot a Nike campaign with 7 star athletes. My pre-production involved weeks of planning as we were shooting on a set designed to look like a washed out old-school gym. I was given a ton of briefs on this shoot however, I was only given 7 minutes per athlete and I really, I mean REALLY had to nail the shot in 7 minutes. Plus, there were at least 10 people from Nike on our small set approving each shot. The most important element from this particular campaign was that myself and my team were super, hyper, prepared! I remember not being given the actual location details until 9 PM the night before the 7 AM call time (yep, imagine that) so Tyler Mitchell, my 1st assistant at the time, raced over to Culver Studios so we could do a lighting demo on our set that was still be built out. It was a crazy shoot but I was really happy with the results! 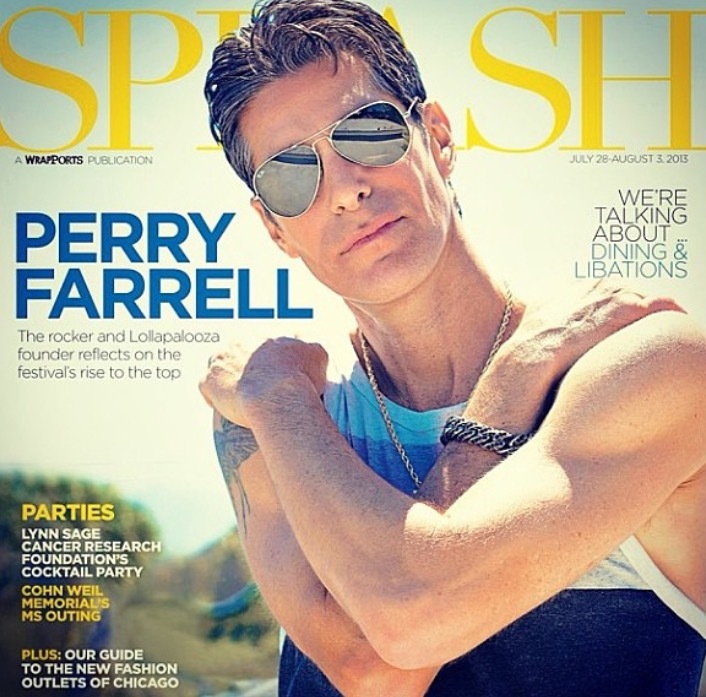 But then there are shoots like the one I did with Perry Farrell from Jane’s Addiction. When Jane’s Addiction’s album, “Nothing’s Shocking” came out in 1988 I listened to it straight for an entire year. I STILL know all the lyrics to every song on the entire album. When my agent called and asked me if I would be interested in shooting Perry for the cover of Chicago Sun Times magazine, I said yes before she could even finish her sentence. The shoot was not that easy, either. I had to shoot Perry in his home in Santa Monica Canyon. He was great but there were logistic things that had I had more time, I feel like I would’ve produced a better shoot. But…OMG, I got to shoot PERRY FARRELL!!! And there it is, the perks to shooting celebrities! There’s that saying, “Never meet your heroes.” But, once in awhile, meeting your heroes (and getting to photograph them) is just utterly amazing!